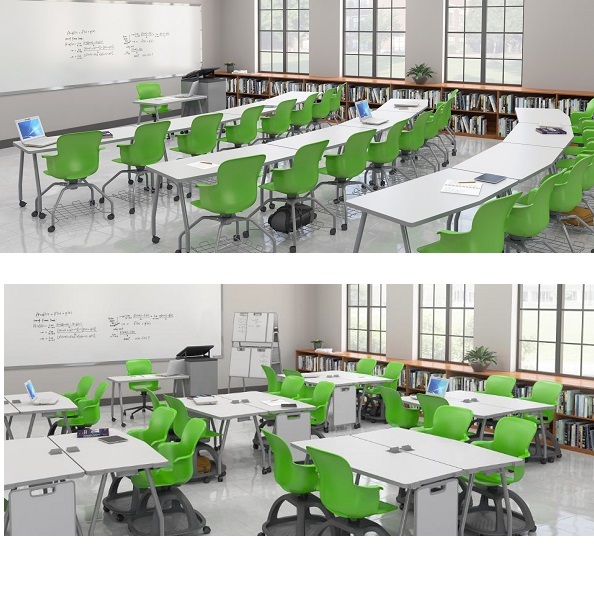 Active seating (aka flexible seating) is all the rave in the academic furniture community. The idea that all students are comfortable in the same type of environment is definitely antiquated. Teachers want students to learn in an environment where they are comfortable and most open to their instruction. The best way to accomplish this is through a variety of options for where and how they do their work. A solid active seating arrangement helps to maximize both student learning potential and your school’s furniture expenditures while creating a fluid and dynamic learning environment for changing curriculum. One way to keep your students engaged is by providing a standing height table solution to complement active seats. The Apex Series Double Student Stand-Up Desk by Marco Group provides a standing height table that is sturdy and easy to move. 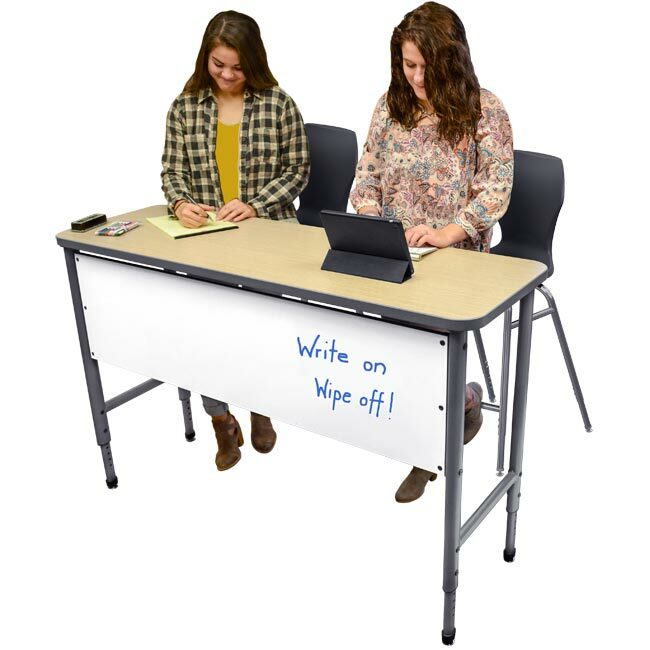 In addition, it offers ample space to study and take notes, supports a dry-erase option, and is height-adjustable to accommodate sit or stand learning preferences. Among the many critical skills that students must develop at an early age are motor, cognitive, and social skills. The earlier children develop these skills, the better it helps them perform in future classes as well as their professional careers. Learning tools such as Easels can help develop these critical skills while also providing a flexible visual teaching aid for multiple classroom subjects and multiple grade levels. Integrating easels in your classroom helps students develop their cognitive skills by visualizing their creative ideas, understand different artistic perspectives, and allows them to express themselves thus boosting their self esteem and confidence. Finger painting, shapes drawing, and imaginations run wild with Art Easels. Designed for early school grades such as Kindergarten, art easels allow children to draw fun ideas and visualize how they see the world. 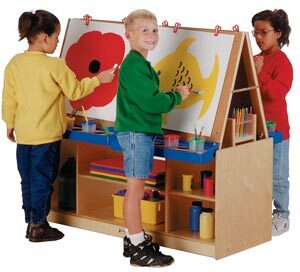 Many art easels also include storage cubbies and drawers for an all-inclusive drawing solution with ample space for multiple students to express their ideas. The 4 Station Art Easel by Jonti-Craft provides a practical solution while offering ample storage, drawing space, and accessories to accommodate multiple teaching scenarios. Teachers often change grade levels and classroom configurations throughout the day. Desks that are both sturdy and lightweight allow for quick transitions from traditional rows to small groups. Collaborative desks give teachers the flexibility needed for their changing learning environments. The Smith System Diamond Desk features telescoping legs that adjust to fit the needs of growing students. The desks can be configured for group work as well as individual assignments. While group assignments promote intellectual stimulation, teachers also need to provide individualized attention for several reasons. For instance, it’s customary for foreign language teachers to administer oral exams involving one student or grading two students having a dialogue in Spanish. Another case might involve a teacher separating one (or several students) to help them understand difficult material on an individualized, almost tutor-based learning which is common in AP classes such as Calculus and Physics. 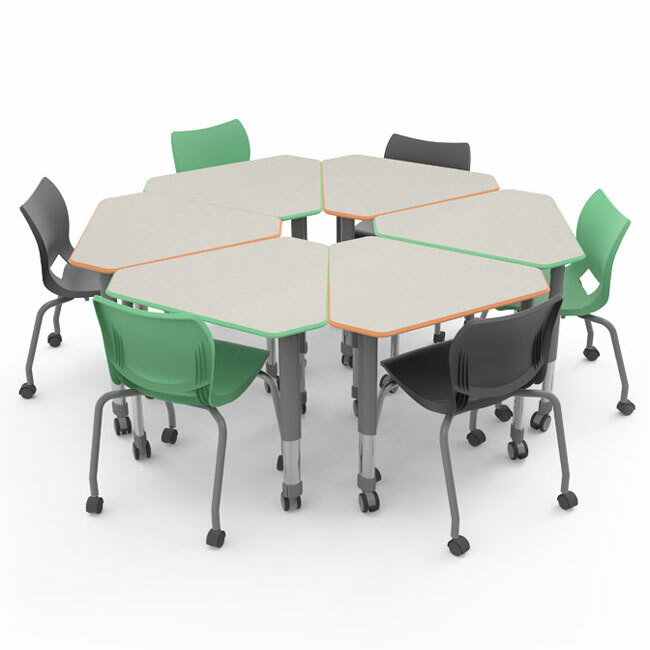 Regardless, a desk like the Yin Yang Elemental Table by Smith System allows group learning and can be easily separated to provide one-on-one or three-to-one teacher/student ratio. Despite having no shortage of technological advances in the 21st century, today’s students still utilize the tried & true desk. Unfortunately, classic desks are becoming obsolete and a growing hindrance since lesson plans often involve student collaboration, on-demand technology usage, and impromptu group work. In order to minimize difficulties and to streamline classroom organization, many schools are starting to utilize training tables as an alternative. Training Tables add teaching flexibility and help promote a cohesive relationship between students, teachers, and technology. Whether it’s a group project or a team-based lesson plan, more and more studies are indicating that physical movement helps keep students engaged. Training tables such as the Echo Series Dry Erase Rectangle Training Table by Haskell let students join different groups and rotate throughout the classroom while allowing teachers to incorporate organized moving into lesson plans.